With its extraordinary terrain and unbelievable speeds, success at the Dakar is about more than speed; quality, durability and reliability are vital. In these extremes, trust is key, and it’s Toyota’s legendary toughness that has made them the vehicle of choice for competitors. Two podium positions for TOYOTA GAZOO Racing SA on Dakar 2018 Dakar 2018 finally drew to a close on Saturday, January 20th in the Argentine city of Cordoba. Disappointment for Ten Brinke/Périn: Elation for Alattiyah/Baumel on Stage 13 of Dakar 2018 If ever there was a stage on the Dakar that proved what a fickle mistress this event can be, then Stage 13 was it for TOYOTA GAZOO Racing SA. TOYOTA GAZOO Racing SA’s Al Attiyah/Baumel notch up thirst stage win on Dakar 2018 Stage 12 sae TOYOTA GAZOO Racing’s SA’s Qatari driver, Nasser Al Attiyah, notch up his twelfth stage victory in the Dakar Rally. Stunning stage victory for TOYOTA GAZOO Racing SA’s Ten Brinke on Stage 11 of Dakar 2018 It was a stunning stage victory for TOYOTA GAZOO Racing SA’d Bernhard ten Brinke (Netherlands) and French navigator Michel Périn on Stage 11 of Dakar 2018. Read more about Toyota's participation in this year's rally with our Daily Dakar updates. TOYOTA GAZOO Racing South Africa’s all-new Hilux featured a host of mechanical enhancements for 2018. A new mid-engine layout, larger air restrictor and a revised suspension set up (with 12% more travel), provides it with excellent levels of balance and handling. The two Team Land Cruiser Toyota Auto Body cars compete in the highly-restricted Production category. This year's cars featured a re-engineered front and rear design and boasted V8 biodiesel engines that ran entirely on a mixture of vegetable oil and algae. Hilux has nothing left to prove. Driven from one extreme to another for 50 years, it has passed every test on its journey to invincible 50. For over 65 years, we’ve earned a reputation for building the most reliable and dependable SUVs around. Today, we have a range of SUVs for everyone, and these legendary qualities are only part of the appeal. From the urban chic of C-HR, to the go-anywhere attitude of RAV4, to the unbeatable off-road talents of Land Cruiser and Hilux, there’s a Toyota SUV to tackle every adventure and every challenge. 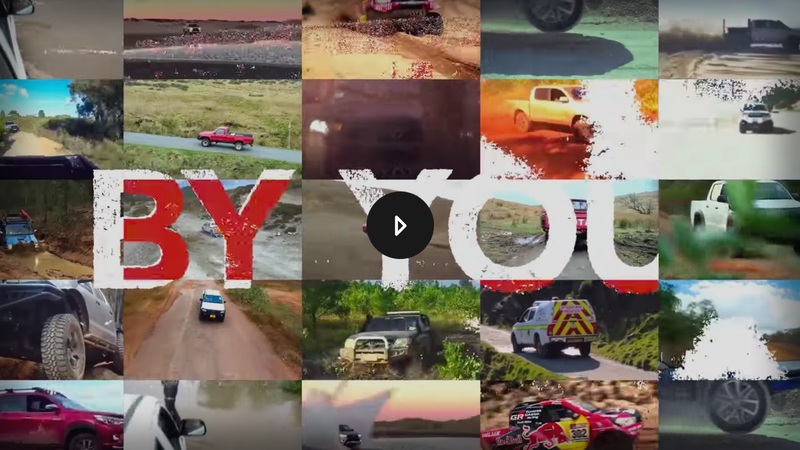 Victory for Toyota Gazoo Racing at Dakar 2019 Toyota GAZOO Racing SA’s Nasser Al Attiyah and Mathieu Baumel bring home their South African-built Toyota Hilux for an historic victory. Toyota presents: Driven - The story of Mike Conway Driven to win. The story of Toyota WEC driver Mike Conway is one of passion and commitment, of making sacrifices and overcoming set-backs. TOYOTA GAZOO Racing From deserts to dunes, gravel to snow, day to night, we’re committed to overcoming every limit to make ever-better cars. Discover more about TOYOTA GAZOO Racing’s motorsport activities. The sky’s the limit: Toyota in the WRC After a successful debut in 2017, TOYOTA GAZOO Racing head into the 2018 FIA World Rally Championship with more knowledge, an improved car and a dynamic driver line-up, ready to push the limits for better. The Toyota websites are using cookies to provide you a safer experience, improve the performance, enable all site functionality and personalise content.